Come out and join us as we remember our Vietnam POW/MIA/KIA brothers and sisters. We will provide a brief ceremony at the commital shelter at the Biloxi National Cemetery on March 29, 2019. 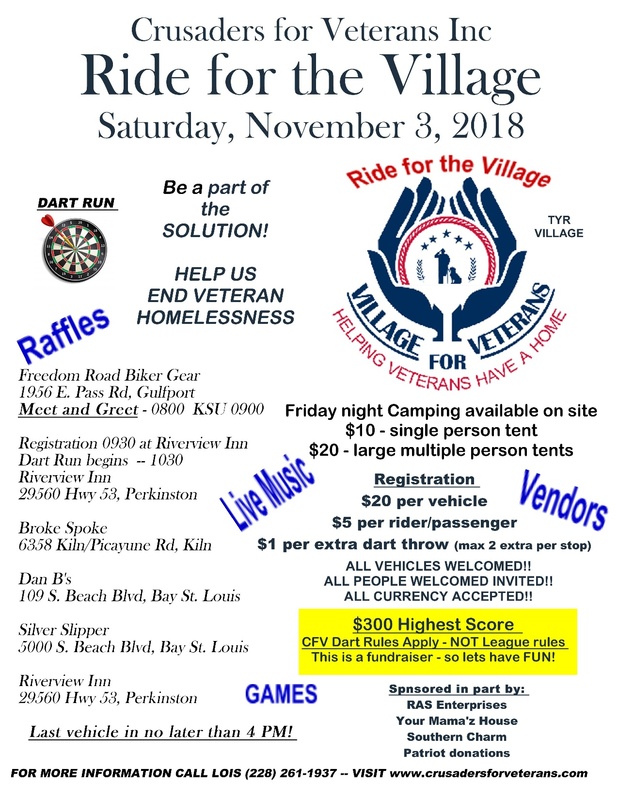 Ride for the Village is our benefit ride to fund raise to construct our Phase 1, TYR Village, Homeless veteran complex in Biloxi. We will gather together at the Hancock County Fairgrounds on April 7th - we are asking for $25 donation for participation - flags will be given out to carry on the escorted ride around Hancock County and return to the Fairgrounds for a Bratwurst platter! If you ride a motorcycle then only $10 for a passenger -- If you are driving a car only $10 per passenger -- all get a Bratwurst platter on return; however, only one flag or T-shirt per $25 donation.